DEBORAH CROMBIE: Recently our local online magazine had a guest piece by an interior designer on how to style your bookshelves. It wasn't until two-thirds of the way through that she said, "And you can even use actual books!" I nearly fell out of my chair laughing. Really? Books on bookshelves? What a concept! But I have to admit one can go too far in the other direction. While I have been writing, and focused on other things, the books have been breeding. It's time to do one of my least favorite things--a book purge. These shelves are partly the to-read books, but other things--obviously--get stuck in here, too. 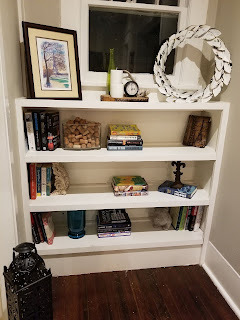 And it's not that I want to fill the shelves with decorative accessories--I just want the books not to be stacked three deep and threatening life and limb every time I walk by! I should probably mention that this is only one side of my office. 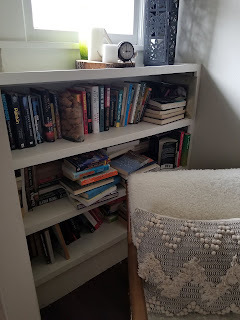 There are NINE other identical bookcases scattered throughout the house, plus two full height bookcases, and the piles of books on both my desks and on every other surface in the sun porch. And Wren's books, which are stacked on a trunk in the guest room. Marie Kondo's THE LIFE-CHANGING MAGIC OF TIDYING UP is all the rage again, with her new Netflix series. It has erroneously been shared that Marie says you should only have THIRTY BOOKS, but she didn't actually say that. I checked. She said you should only keep books that "spark joy", which can be wildly different from one person to another. But when books are your job as well as your passion, deciding which ones "spark joy" is daunting. There is a lot of guilt involved--books I meant to read but haven't, books I thought might be useful for research but haven't opened, books I thought I would reread...but, will I really? Am I ever going to find the time to read Wolf Hall? Or A Suitable Boy? Or a few dozen (um, hundred) others? AND, I had been promising my daughter for at least a year that I'd help her clean out her living room bookshelves--because a large majority of the books were mine. Last Sunday, we tackled that. (There's another identical built-in case on the other side of her fireplace.) She ended up with ten full shopping bags to take to Half Price Books--and I brought home four bagfuls that I have nowhere to put! So, dear REDS and readers, do you have a system for keeping books under control? Which ones stay and which ones go? Please share!! PS: Here's Kayti's Marie Kondo-worthy "after" shelves! Don't worry, book lovers. This state of bareness will not last! I am far better at collecting books than I am at getting rid of them, so I have no insightful methods to share. And I have no system for keeping the books that seem to multiply like rabbits under control. [My current management strategy involves more bookshelves] . . . .
Of course, there are boxes and boxes of children’s books stashed away from a gazillion years of teaching . . . those do go as the grandchildren reach the proper ages to read and enjoy them . . . . I can remember my mother-in-law visiting our house one time and asking me why there were so many books on my bookshelves. Well, do I really need to say that my MIL and I view reading and books and most everything differently. I sometimes think that I want to move over to Indiana (from Kentucky) to live in the same town as my daughter and her family, and I will look on Trulia for houses. I've about decided that I will never move solely because of the lack of built-in bookcases in most houses. There was one built-in when we moved in here 30 years ago, and I've since had two more large bookcases built-in. And, I've bough a gigantic free-standing bookcase with glass from a furniture store, and I have some small free-standing shelves scattered throughout the house. And, I still have baskets and piles and a "book table" in my bedroom that is a large round table covered in stacks of books. I have actually weeded before, but I remain surrounded and happily so. However, I do have a large plastic tub that I have been working on filling for a couple of months to donate. I laughed at myself yesterday when I bought yet another basket from Target for only my absolute next to read books. Filled it up in just a few seconds, but it did clear one pile off of the floor next to my reading chair. My daughter, who is a Marie Kondo twin, just sighs in despair when she visits, but that's okay. My granddaughters call my home Grammy's Library, and that makes my books and me happy. Oh, yes, it's funny how quickly those books can multiply. I'm of the opinion that books are for sharing and I almost never reread, so I usually don't have trouble parting with my books when I'm done with them. Mine typically go to the library or the women's shelter. That said, at the moment my TBR piles are threatening to topple over. Funny thing about books I got rid of - many of them I wish I hadn't. My first book purge if you can call it that was when my house burned down, although I was able to salvage some of those books. I actually started to replace many of the ones I lost and then in just a few years' time I found myself with a ton of books I would have to get rid of because I was moving to an apartment and there was just no space. A couple years after that I built this house and the books really started multiplying! My mother died and I got a lot of her books. Of course I am still buying books but not as many as I used to since I am taking advantage of the library. But I love my books - even the ones I might not read and you better believe that seeing a lot of books around my house does "spark joy"! I'm with you guys--piles of books spark joy! And things always get out of control during intensive writing periods, plus Christmas and the birthday season. I suppose one could institute a "one-in, one-out" rule...theoretically. I'm going to try to gather some up this week to take to the next Friends of the Key West library sale! But now the problem has come back again. I do mainly shelve with the books stacked rather than standing on end. I don't have room for any more bookshelves!! Oh, I am doing exactly the same thing! Exactly! And the problem is so many of my books are signed to me, how can I get rid of those? But I agree, do you keep a book you will never ever look at or read again? What is the point of keeping them? On the other hand, I might need them. I really might. My goal is to have no stacks of books, only keep the books that can fit in the shelves. I’ve got to admit, that is never going to happen. But I will persevere. Oh, and libraries won’t take advanced reader copies, because they cannot sell them. So what do we do with those? Plus, it seems cool to have those. Debs, I saw Say No More on your shelf and it filled me with joy! Thank you! But you are absolved, and I fully release you to give it away. Yeah, I still haven't figured out what to do with ARCs when I'm done. Ah the problem of the signed book. That's why I often ask the author to just sign and date. Because most books I buy end up getting donated to my library's used book store... after I read them. DO NOT GIVE ARCS to your library bookstore or anyplace else where they could get sold. It's illegal and generally bad form. Give them away. (Or, dare I suggest, recycle them.) I've got a local retirement center that happily takes mine. A retirement center, what a great idea, Hallie. I used to take books and especially nice magazines to my mom's care home, but now that she's gone I'd kind of forgotten that option. Hank, your books need to be moved to the "books by friends" shelves downstairs:-) The first few years I was writing, the "books by friends" up one shelf in a bookcase. Now, needless to say, there are quite a few designated shelves. Hallie, I'm going to have to adopt that approach. And I never give ARCs away where they can be sold - I even loaned some to my dad and warned him not to give them to the used bookstore in his town. Send them back. I do, however, have a signed ARC from you from Bouchercon Cleveland(?) on my "prized books" shelf. THERE WAS AN OLD WOMAN. As the saying goes, "There's no such thing as too many books. There is, however, such a thing as not enough space." I've started creating piles as I read. If something is from a dear friend, or I loved it so much I think I'll read it again, I keep it. If not, it goes in a pile to take to Half Price Books. I still feel slightly guilty, but I think of it as rehoming. I didn't love it, so I am setting it free to find someone who does. Your saying made me laugh! I used something like the "Pile Method," too. I like Mary's thought: "I didn't love it, so I am setting it free to find someone who does." Exactly. I purged after I moved into my current home--so many books I carted around simply because they were books. Now books I will re-read until the pages fall out are in the living room and bedroom. Work-related books are in the basement lab, and other essential books that I will pull out when I need them also have a dedicated shelf. But, I MISS browsing and buying and sharing and filling up more shelves. Sigh. I know just what you mean, Flora! There's something so satisfying about buying books. It's like buying a treat for your inner child! We're overdue for a purge, including my high school books. Over the years, I've donated most of the children's books to various causes, which gives me great pleasure. When we unloaded the Atlanta house, the realtor told me to empty the bookshelves because my "target market" doesn't read. That is really sad, isn't it? REALLY sad. I read and weed... regularly. My office is bookshelve-lined but tiny. My husband is a book collector. I mutiny when there's no more room on shelves and piles of books start growing on the floor. I don't know what he does with them then. I hope we never have to move because that's when I'll probably find out. I'm so happy to know that Marie Kondo did NOT say you should have only 30 books! What she actually said makes much more sense. Five years ago I read her book, and it truly did change my life. On that occasion, I parted with 400 books and kept 400, using her spark-joy method. Then I categorized my books in different book cases. All my French books filled one book case. I sat looking at it, after it was all arranged with according to ascending height. And the thought came: I love French so much, and I rarely get to speak it; I wish I could be in a French book club but there isn't one around here. IDEA: Why don't I start one? So I contacted the local Alliance Francaise and started a French Book Club with them. It's still going strong. But here's the best part: A French woman in the club said to me, "You really love French. How often do you go to France?" I answered that sadly, I had not been there in 35 years. Then--YOU WON'T BELIEVE THIS-- She said, "I have a house in the countryside in the south of France where I go 4 x a year. Would you like to come with me sometime?" So I went to France for 2 weeks, it was heavenly, I took lots of notes, and now I am writing a mystery set in that location. All because I used the spark-joy method for my books. Keziah, I love this story!!! What a wonderful outcome. You should find a way to share it with Marie. I would.love to tackle my whole house with Marie's method, but I can't see when i would find the time. How did you? And how long did it take? As I recall, I gave a good block of time each day. The days were not consecutive. But they were close together, because once I got started, I felt the energy of the thing, and I was on fire to keep going. She has 5 categories, the first being clothes. I started there. It might have taken 2-3 hours to get the clothes sorted. But once those bags of donations were out of my house, I felt as if my house was so light, it could rise off the earth. In a good way. "Ascending height"? Not by author? Not by title? Not even by publisher, but by height? WHAT???? LOVE this story, Keziah! Congratulations! Real joy! And a French book club -- wondrous. RICK--Yes, that's what Marie Kondo advises. She says we feel happiness on looking on an ascending line. Thus, books should be arranged by height, and women's dresses, by hem length. So that when you look, your eye goes up, and you feel good. LESLIE-- Merci! Yes, wondrous indeed! Space is the issue, isn't it? My kindle helps with that but I really prefer to hold an actual book. I prefer reading from a paper page as opposed to the screen. But, that's another topic for another time. I curate my book collection and then I donate. Books that live with me are written by favorite authors or because they spoke to me in a way that changed me. I also have a group of books that are so beautifully written that they serve as "tutorials". I haven't paid any attention to Marie Kondo. I'm hanging in there with William Morris. "Have nothing in your house that you do not find useful or believe to be beautiful." Mr. Morris did not require "tidy". Actually, I think Marie would agree with Mr. Morris. She really is saying the same thing, isn't she? Ahh, I find so many thoughts going through my head as I read these comments, and I just can't pull any answers together. I am surrounded by books. That is the state of my life. I have done several purges but the shelves still seem to be full. Oh, Rhys, that is such a problem. About five years ago, I hired a helper for a few months to help me organize all my author's copies. He did a great job and we got them all in labeled storage tubs, with a master list of the number of copies, and then we organized the storage tubs in the attic. Then a few months later, we had a bad storm and had to have our roof replaced. A composition roof had been laid over the original shake shingles, so they had to strip everything off and put down decking for the new roof. It made an incredible mess and those nicely organized boxes of books are still covered with roof debris. I just have not been able to find the time or energy to get in the attic and clean it all up. I'm a bit of a hoarder by nature, but I do purge our bookshelves periodically. And, I pass on most books to friends or donate to our local library's used book store. Still, there are those by favorite authors and books that I loved so much that I can't quite force myself to give them up. I have a worn set of the Travis McGee paperbacks that I've had since the 70's and 80's. As to Ms. Kondo, I'm grappling with her Spark Joy concept in regards to my To Be Read pile, which well exceeds 30 or even 40 books. I suppose their covers or jacket blurbs sparked joy when I first picked them up. So, that means I just keep them until I've read them all? Sherry, According to her method, if you wanted to follow that, the answer to your question would be "no." The question you ask yourself is, "Does this spark joy for me now?" Her book is charming to read. Expiration dates might be a good idea -- I'll let you know! When we replaced our upstairs carpet with wood floors last summer, every book had to come out of my office. I reloaded the shelves, of course, but have 2+ boxes filled with books on writing that I either never read or don't think I need to keep. My goal was to go through them bit by bit, and anything left by August 1 -- one year after moving back in -- would go. Do you know, I'm not sure I've touched any of them yet! Deb: You are my hero. Someday I will have that many books. I try to organize mine. I have Agatha Christies on one shelf, Charles Todds on their own shelf, manuals on a shelf, a small section for hardbacks, a Joe Ide section, a TBR bookcase and a bookcase for books by people I know. I'm lousy at keeping track. I got so frustrated looking for Hallie's mystery writing book that I ordered another one. When I was done reading it, I went to put it away and the place I picked was next to the first book. Argh. Keenan, I, too, have a whole shelf for the Todds, every book in both series. Those are keepers. Our Rhys has her own shelf, as well. At the moment, Julia is sharing with Louise Penny, but I will make room for more. Hear that, Julia? I thought Kindle would be a lifesaver for my bookshelves. Then I discovered Kindle's role was to tell me which books I needed to buy in hardback to put on my shelves. FAIL. My rule of thumb - I keep books on the craft of writing, research, crafts, read agains, and autographed. Those are the new books. The older books are my out of prints, sentimental, just because, full sets. For the most part I have managed to rehome my paperbacks. Fifteen years ago my husband and I moved and boxes of books did not follow. The movers lost them. It has made me cling tenaciously to those older books I have left. Kait, that cracked me up. I thought the same thing about my Kindle. I suppose it has been partially true. But I have a little reading club between me, my daughter, and our friend Gigi Norwood, so if I read something I really like on my Kindle, then I think, Kayti and Gigi will want to read this, too, so I buy it... Or if it's really special, then I want a hardcover copy to keep. You do know you can share your kindle library with something like six family members. Gigi counts as family. I feel your pain. 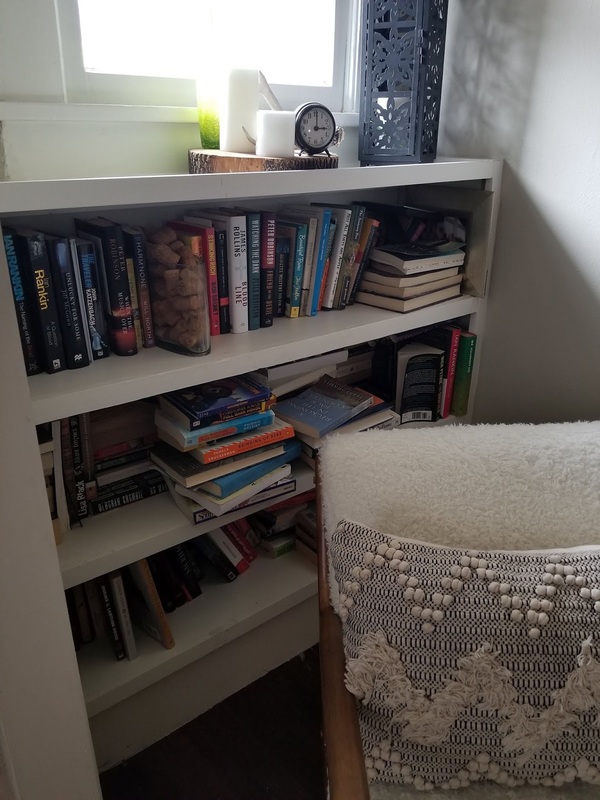 I looked around and realized that I have bookshelves in every room on our condo except the dining room and the bath rooms (if there were only space there I would). then I remembered my parents' house and there were bookshelves in every room there too. My decorative elements keep getting crowded out but I do try. I do try to purge. My husband pushes me especially at Christmas when we both receive so many as gifts but I had to laugh as this year, his is the chair with the biggest pile next to it. Some of my books are old paperback friends, comfort in hard times. I thought that I would just put them on my Kindle and move along or get them out of my library. However they are no longer available, and my library seems to have purges also so what's a girl to do? So far I can't give them up. I do purge to my friends, to the local thrift store, and when i retired from teaching French I gave my books (15 boxes worth) to my former high school for the library there. At a gathering there one time, a French teacher saw my name tag and told me she had my Racine, Corneille, and Molière on her desk for a class she was teaching. My current project is to get rid of the wonderful cookbooks I am no longer using. So far no one wants them except the thrift store. And BTW, Margaret, i was horrified to know that Atlanta is not a book shelf market for real estate. Oh, cookbooks. I am such a sucker for cookbooks. I've just weeded a few from my kitchen cookbook cabinet to make room for more. I try telling myself it's one-in, one-out, but that doesn't seem to work too well. COokbooks--I've donated lots of them. I agree, there's something the feels substantial about looking up a recipe in a book . ANd if they're sentimental, dappled with gravy and splatters, I have to keep them. But the internet is faster. Only 30 books? That's simply not possible! OTOH, our house, basement, and garage are FULL of books. We did a good job purging last summer. I read almost entirely on my Kindle but it was still hard to give away my mysteries and other beloved series. Yes, the purge made a difference but we still have ling way to go. I don't even pretend I'll be the minimalist that Marie Kondo is. I need the comfort of my family heirlooms, candles, etc. I’ve begin getting rid of reference books I’ll never need again. It’s hard for me to get rid of mysteries. Unlike lots of people, I like to reread favorites to see what I might have missed the first one or two times around! I keep all signed books, and I don’t lend them out; they are precious to me. Lately I’ve been going through mysteries by authors I don’t read that much, and giving them to a friend for her home-bound mystery-loving sister. She can keep them, give them away, throw them out when she’s done. My library will not take donations of books published more than ten years ago, which really surprised me. My Kindle continues to be a godsend, especially for thicker books, which are so painful to hold in my hands, plus it frees up a LOT of space at home! In the last couple of weeks the arthritis in my hands has been acting up, and I’m getting caught up on my TBR Kindle books, as there have been days I’ve had to put print books down to tend to my hand and wrist pain. I don’t try very hard to get rid of books, though, because it seems almost immoral! DebRo, thank goodness for the Kindle! My library doesn't do sales and doesn't seem to want donations. We have a great Half Price Books in our town (our only bookstore) and I like to support them as much as possible. It's not that you get much money for the books, you don't. But it makes books available to readers who might then go out and buy copies of an author's other works. Just remember, when you finally bite the bullet and start weeding out, that books are heavy. Pack them in small boxes or they'll stay around because you can't lift them. So true. I don't ever use boxes. I put books in reusable grocery bags--Trader Joe's are great for that. Easy to load into the car and take into the book shop, and then you just re-use the bags for shopping. Cardboard wine and liquor boxes -- I snare mine at Costco -- are just the right size! About three years ago, thinking not so much about having too many as what someone else will have to deal with when I'm "gone", I stopped buying books. That really meant no more than one per month, not counting ebooks. At the same time, I began weeding. I have donated a lot of books to the library bookstore, sent boxes to friends who love the same genre and enjoy getting older books, even recycled some. My criteria is "will I read it in the next year, or will I read it again?". 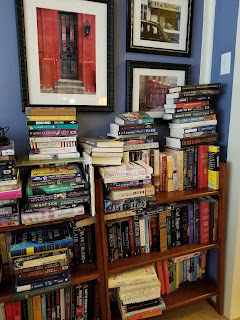 It's been effective, though I still have a heck of a lot of books, on eight-foot built in bookshelves in three rooms, plus a small TBR bookcase in the bedroom. I've had success with read it and donate it. Honestly, there just aren't that many books that I love enough to clasp to my bosom and think "I love, love this book!". So ld favorites, books by favorite authors, the TBRs and books that have great appeal stay. Anything else may be on the block when I decide to weed that shelf. I have a weakness for cookbooks and knitting books and I keep about 50 of the two combined. Marie Kondo would approve! I’ve also kept the hooligans’ fave series and picture books and that’s it. I have one copy of each of my books but otherwise I own no fiction. Hub on the other hand has four towering bookcases with over five hundred books, mostly mysteries with a solid collection of music bios mixed in. We are the odd couple when it comes to books! LOL! Jenn, you are a marvel. But you do read fiction, so is it one in, one out? And how do you manage your giveaways if you don't keep your own books? Every book I buy comes first to the kindle as a sample. That takes care of the TBR pile. The only hard copies I keep are signed first editions. Period. I’m so thankful now that I have but one useful hand. For the time being. Julie has jillions of books, most of which she’ll never touch again. Not my circus. Not my monkeys. Shalom Reds. Our community supports two used bookstores. They are side by side and use the same front door. I have been in them only a few times within the last ten years. I don’t visit because I know that I own too many books. I actually like reading on my tablet but especially if I like a book, do I like owning the hardcover. Owning too many books doesn’t stop me from looking for bargains on Amazon. Having a backlog of too many To Be Read books is a new phenomenon for me. I am not sure of the solution. I enjoyed reading everyone’s comments. I feel overwhelmed by all the things I want to say, so I will tell my favorite story about too many books for the space. I knew a charming, well-educated couple who spent all their free time reading. They just took that for granted. Being invited to tea was pure delight. They were gracious and kind, had wonderful life experiences, and the conversations were mostly about books. When the lack of space for books became a burden they added a library to their house. It was a large room with skylights and the center of the room was filled with rows of bookshelves, just like in a library. (By the way, research shows that bookshelves in the center of a room provide more efficient storage than shelves along walls.) The room was a carefully organized, light-filled oasis. That room inspired me years later to add a second story to my tiny, cramped house. I added a living room lined with beautiful bookshelves with doors based on the paneling in English country manors. (Which still need a second coat of stain and a sealer.) Nothing is ever perfect. I can’t tell you how much comfort and joy it brings me just knowing that so many old friends, and new friends waiting to be read, are all around me on days both dark and light. Maria, that's a lovely story. Maybe I should just think about the people (especially children) who come into my book-filled house and find it warm and inspiring. Which it is. Example (see my earlier comment): I bought a new novel at a convention, had it signed (not inscribed) by the author, so, a signed first edition, first printing. It sat on the shelf for a decade. I finally read it, enjoyed it, posted a review on my blog. One comment said she would really like to read it. So I sent it to her, a gift to do with as she wished. One less book, everyone happy. 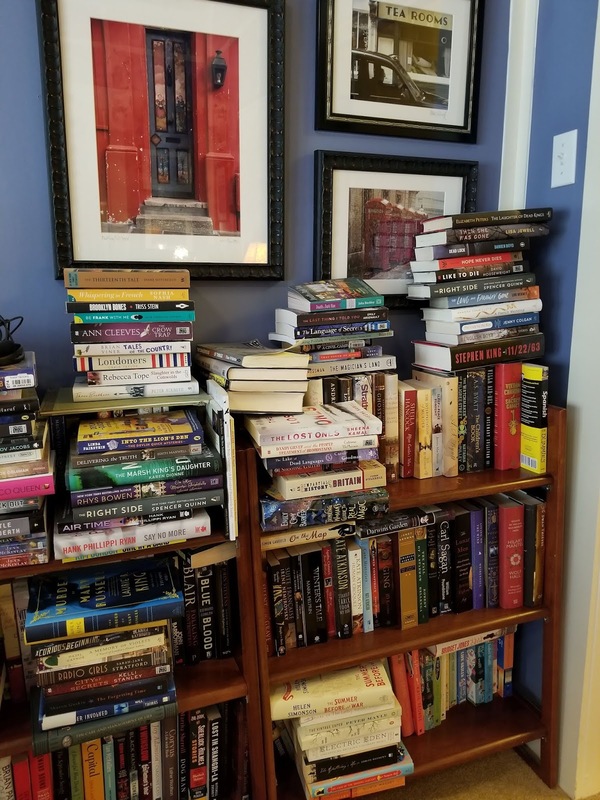 When hubby & I last moved, we had over 70 boxes of books... we’ve both said never again and have done major purges.... but probably have at least that many books still. The library book sale takes most of them and luckily our library will take almost anything including 30 year old textbooks from college.... Some books are old friends though, and I refuse to part with them....like my LM Alcott set from childhood, or the books from my mother’s childhood that I still have, that I guess would be antique now. Oh, and if you’re moving, go to your favorite bar and ask them to save you the boxes bottled beer comes in.... they are the perfect size for books! This is helpful, Debs, both your entry and the comments. We are moving in four months (if all goes well), from a house with ample bookshelves and books in every room (including the laundry room). The new house will also have lots of bookshelves, but I don't want to haul all these books over there. When we were emptying Steve's office in preparation for tearing it down, we had a book dealer come to shop the shelves of books with natural history topics. They ended up buying a number of books, which was a bit of a surprise to us. One book was worth $300. Novels might not fetch anything like that amount, unless they are pretty special, or a collector's item in some way. Our library here in Cincinnati has a dedicated warehouse for donated books. They sell them, from the warehouse all year, and from several branch libraries twice a year each. Ten years ago or so I purged 1,000 books, and the library sent a driver and truck over to pick them up. Painless, and I got a nice, fat deduction for our income taxes. Not that you could tell I'd taken a single book out of this house. And I'm pretty sure I've brought over 1,000 in again since then. Sigh. Timely subject as we are currently culling through all of our bookshelves. A job that is not for the faint of heart as we have bookshelves in every room....One entire wall in the dining room, two large kitchen bookshelves strictly for cook books, two tall shelves in our bedroom (one of which was made for me when I was 12...60 years ago! ), three bookshelves in the guest room, and a hefty one in my husband's study that I'm not allowed to touch. Problem is that I want to keep them all. Just the sight of all of them is comforting and brings me joy! The saving grace is that our town recently completed building a rather magnificent library!! I wish I could drop in every day, the building and courtyard are modern, yet warm and welcoming, a dream in the making for years as it was previously housed in two small storefronts. There is a "bookshop" within the library that is fully staffed by volunteers and this has finally encouraged me to share the wealth of our home library. Opening day one large shelf was filled with my cookbook donations and they were all sold! So on we plod one book at a time. As for Kindle, mine is loaded and I apparently can't keep track of what I have on it, since Amazon, not infrequently, will remind me when trying to purchase, that I already own it. A system to keep books under control? Surely you jest? Well, I've actually only recently begun to get some books put into boxes or bags so that I can bring them to the library. But it will be a long drawn out process. It won't just be my books, I have the entirety of my parents books to go through as well. I know that for my own personal collection of books, I have to pare down what I keep after I read them. I just won't have the space if I don't. I think I've said it in prior posts about what books we keep, but if it is a signed book, they stay. Or if it is an author that I'm a HUGE fan of, they stay as well. But I've come to the realization if I just "like" the author and there's no chance that I'll ever go back and re-read the book, it's got to go. I've also kept books I've read. Mostly from authors I know from Crime Bake or otherwise, whose work I like. Another benefit to saving books: Sometimes when I'm writing and get stuck, I turn to the shelves, thinking "how did ___ handle that?" and even if I don't find a comparable passage or problem, I seem to find the solution, just by having gotten lost in someone else's pages for a few minutes! Yes, me, too, Leslie, and there are quite a few I keep just for that inspiration. I love this technique! I'll have to remember it! This is really tough! When I moved, I gave away many books because of space limits. Fortunately I kept the books that were discontinued when the series ended. Unfortunately, I gave away some of the books in that series, not realizing the series was about to end! I give away many books that are very popular and I know they will be in the library so it is there when I want to borrow it from the library. I now have too many books. It is hard to stop myself from buying more books. I wound up reading them once then not again so these are the books that I can give away! I try to remember to keep the books that I would read again and again. I have created little "tables" out of piles of books. I make myself give books away that I've read. But not the ones I've started and for some reason, didn't finish yet (even though I liked the book). Sandra, I do that too. I agree that Marie’s saying about “sparking joy” is another way of framing the idea of finding something either useful or beautiful. I loved her book and it has really inspired me to start clearing away excess stuff. I haven’t tackled books yet, but have done a couple of purges over the last ten years, and I read almost exclusively on my Kindle/iPad now, so it has cut down on my piles. I know a lot of people are die hard “real book” people but I can read so much faster on my Kindle and I can get any book I want in seconds, and the real blessing for me is I don’t get hand and wrist issues with my iPad. I will always keep my colllection of Jane Austen, and any signed books. I have one of Julia’s which is signed, given to my husband by Ross, because he learned I loved reading and writing. I immediately read her whole series! One more comment I have is to be sure to check inside your books before you give them away. I once gave a biography of Jackie O away, since I knew I would not re-read it, and after dropping it off at the Goodwill, my husband casually said “one of those books had your Dad’s writing in it” and my Dad passed in 1993, so I was upset and I called Goodwill the next day and they gave it back to me. In the front, my Dad had written the names of all the people in the book whom he had actually known and how he knew them I was so glad to get it back. Helen, Amazon has reminded me, too, of books I already own. In the last few years I haven’t always remembered book titles, My bookshelves don’t do the same, and I have had to return something I realized I already owned! I've also ordered the same book more than once because of different British vs American titles...Or a re-issue of a book....same book but different cover! Since I was a child, I've always had to clean things out if I felt that I had too much stuff. But it depends on the space so I don't worry too much about keeping my sentimental favorites even though I haven't reread a book for years (at least knowingly!). If my TBR pile gets too big, I will try to get it down. I don't keep many current mysteries except for ones with good recipes. It really doesn't help when we have several of these every year. We spent 4 hours with a coffee break in between to browse our treasures. We now need another book shelf. It is truly addictive once you start you keep going. Just a while longer....you might find the 2nd book in this series you've discovered. Now have the set ...except for number 2!!! ..... or..... So I don't think I'm the person to be advising on culling books!! Love you, though! We are all in this together, right? Last year I decided--after much prompting and nagging and urging from my partner--that I would do a selective book purge. I opened a box of books that had been in the basement since our move here 14 years ago, due a lack of book shelves. The first book I found a book was a collection of essays I remember reading and loving, and reluctantly I decided I probably would never read it again. Sigh. It could go. I opened the cover for one last look and found a program from an Eagle Scout Court of Honor--for the twin sons of a beloved friend, who had died just before that event, waiting for a heart-lung transplant. No donor had been found and we had gathered to support her sons who had been guided to that milestone by their mother, their Scout leader. Now I remembered reading the book of essays while I waited for the program to start, the two things inextricably linked. I could never give this book away. And that was the *first* book I picked up. One more thing to add: I had a very hard time deciding where to donate my books (haven't left home yet). It bothered me that our library sold them for a quarter each at the annual sale--even lovely, hardback books in perfect condition. Didn't the library want to make money, in our tiny, poor town? But then I found the Vietnam Vets of America (www.pickupplease.org) who accept donations of books, use many of them for literacy programs, and with the money from those that they sell, our state (Oregon) purchases & trains comfort dogs for vets with PTSD. Because my brother, an Afghanistan vet, ended his life as a result of PTSD (we presume), I am grateful they are turning old books into lifelines--one form of comfort into the only comfort that may mean even more. Beth, thank you so much for sharing these stories. And what a wonderful program Vietman Vets of America sounds. I am going to check it out to see what they do in our state. Books, and dogs, are such incredible comforts. It's late and I have nothing to add that others haven't already said. But I am grateful for your post, Deb, and for all the comments because it makes me part of a book crazy family of readers and writers and I can smile as I look around and see books, books, books everywhere in my house! This service is obviously for people who need to fill their bookshelves with colorful books they may never read, rather than for readers of this blog who are looking for creative ways to add more books they intend to read to their homes.